There was a lot of skepticism when Gabe Infante arrived at St. Joseph’s Prep in 2010. He was the “interloper” for North Jersey who was supposed to be a “stepping stone coach” for the true head coach of the Hawks’ football program. The “stepping stone” lasted nine years — and departs the prestigious prep school on 17th and Girard as a legend. Infante, 45, announced Saturday morning in a very emotional sendoff to his team at St. Joe’s Prep that he will be leaving after nine years — including four PIAA state championships, a 91-22 overall record and an .805 winning percentage, a 27-game winning streak and countless young men that he impacted — to take over as Temple’s next linebackers coach under new Owls’ head coach Manny Diaz. 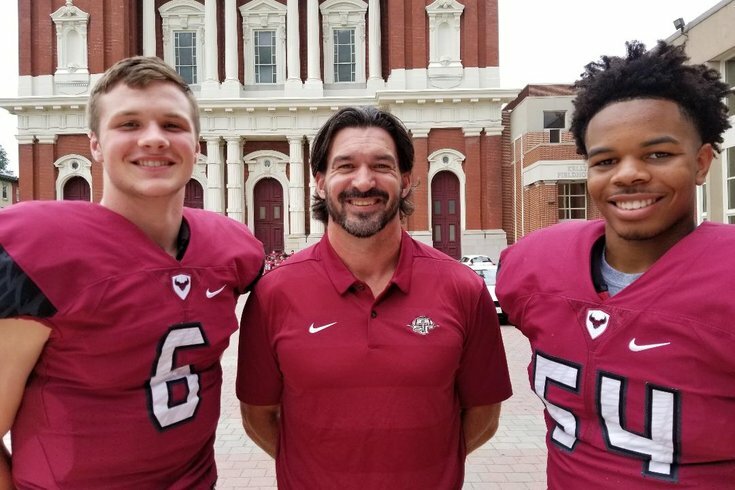 Tim Roken, the St. Joe’s Prep offensive coordinator who has been with Infante since his first day at The Prep, will take over as the new coach of the PIAA 6A state champion Hawks, who finished 13-0 this past season. The Prep returns a core group that will be among the top five high school programs in the country next year, featuring sophomore quarterback Kyle McCord, PhillyVoice’s Player of the Year, sophomore linebacker Jeremiah Trotter Jr., the son of former Eagles’ linebacker Jeremiah Trotter who made a team-high 12 tackles in the state title game, and Marvin Harrison Jr., the son of NFL Hall of Famer Marvin Harrison, who made a game-high eight receptions in the state championship. “This is the most difficult thing that I’ve had to do, this has been a labor of love for me,” said Infante, who is one of four finalists for the U.S. Army All-American Bowl National Coach of the Year Award, which will be presented at the game held on January 4 in San Antonio. He won the award in 2017, the last time the Prep finished an undefeated season and won the state championship. The Prep is 41-1 over the past three season and won two state titles over that time (four in the last six). “This has been my life’s work and it’s very difficult to leave,” Infante said. “I love these kids and this program. I’ve always seen myself as a father figure to the kids, my kids. But the job of a father is to prepare their children for life without them. It’s not an easy thing to let go. This was a difficult decision, but necessary and I won’t be too far away. Infante took a strong program under previous head coach Gil Brooks and made it stronger, bringing it to national prominence. He leaves a legacy that will forever be a part of the St. Joe’s Prep football. “The only legacy that I want to be known for is the kids that I helped, and if there is any magic or anything worth celebrating, I think it’s that we were able to create a well of sustenance that so many young men were able to drink from, which fulfills the original mission of St. Joe’s Prep,” Infante said. “We provided a lot of opportunities for kids, and helped a lot of kids who probably didn’t have many other opportunities to go there and get a great education and have their lives transformed. 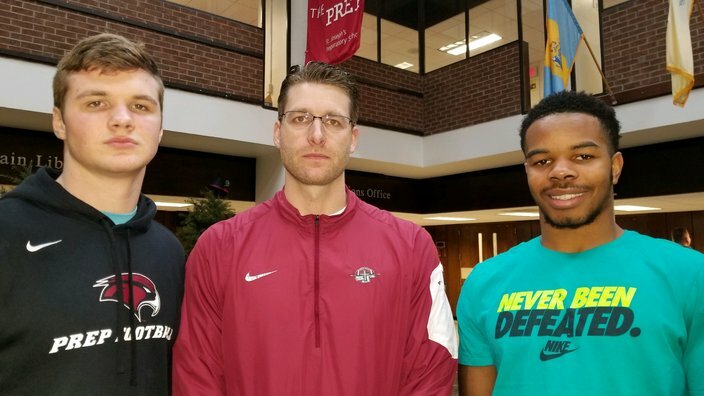 New Prep coach Tim Roken, center, is flanked by QB Kyle McCord, left, and LB Jeremiah Trotter, Jr.